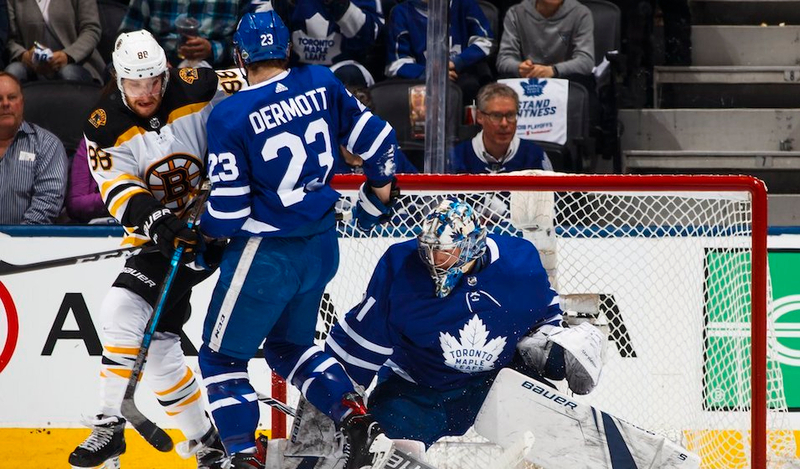 The Bruins and Maple Leafs treated hockey fans to a thriller game three tonight that resulted in a 4-2 Leafs victory. The Bruins still lead the series 2-1. It was a back and forth affair all night long but Auston Mathews’s go-ahead goal in the second period made the difference. The Bruins dominated the first two games of the series at TD Garden, but neither team was able to decisively take control of Game 3. James van Riemsdyk scored a power play goal in the first period to give the Leafs an early 1-0 lead, but the Bruins still had plenty of chances to get on the board early. The second period saw an offensive surge by both teams, but the Leafs would head into the final frame with a 3-2 lead. Bruins defensemen Zdeno Chara and Adam McQuaid both scored, but Auston Mathews first goal of the series but the Maple Leafs ahead for good. The Bruins were all over the Toronto defense in the third period but Leafs goaltender Frederick Andersen made jaw-dropping saves left and right as he managed to deny all potential Boston equalizers. Patrick Marleau scored his second goal of the night with a little under four minutes left and the Maple Leafs hung on to make the series 2-1. The teams once again showed their disdain for each other, however, it was a pretty clean game compared to the opening two games. Four penalties were given out over the course of the game. The Bruins now have two days off to regroup and prepare for game four at the Air Canada Center on Thursday, April 19 at 7 p.m.